MASTER OF DESIGN (AUS) (Bay or Brown 2005-Stud 2012). 7 wins to 1300m, ATC TJ Smith S., Gr.1. Sire of 106 rnrs, 51 wnrs, inc. SP Miss Wahoo, Creative Genius, Creativity, Kinetic Design and of Greyworm, Port Vale, The Mitigator, Cranbrook, Jaminzah, Knight Commander, Party Planner, Senor Gaudi, Star of Patch, Swiss Design, Vin Fiz, Bennelong Dancer, Deal Master, Gucci Guccimo, Incision, Masterati, Cath's Village, Gaudi, Milord, Another McCloud, etc. VIENNA MISS (f. by Snitzel). 2 wins at 1550m, 1600m, A$162,180, SAJC Adelaide Guineas, L, Peter Elberg Funerals 3YO H., 2d SAJC Quayclean H., 4th SAJC Morphettville Guineas, L.
Little Bit Ditsy (f. by Bel Esprit). 3 wins-1 at 2-from 1000m to 1600m, A$135,050, BRC Diona Civil Engineers H., Canadian Club H., Sirromet Wines 2YO H., 2d Qld Tatt's RC Breakfast Creek Hotel 2YO H., BRC Novotel Brisbane Airport P., 3d BRC Princess S., L, Canadian Club 2YO H., Channel 7 P., Drumbeats at Lyndhurst H., GCTC Tattsbet H.
Hatupatu - Longwah Supreme (H.K.) (g. by Southern Image). 4 wins at 1200m, NZ$6,750, HK$2,379,000 in NZ and HK, HKJC Chinese Recreation Challenge Cup, HKU Social Sciences Alumni H., Being Famous H., 2d HKJC Macau-Taipa Bridge H., 3d HKJC Atlantic Ocean H., Panasonic I-Pro Network Surveillance System H.
LET IT SLIP (Not a Single Doubt). 4 wins at 1000m, 1200m, A$311,225, Pinjarra RC Magic Millions WA 3YO Trophy, RL, WATC Placid Ark S., L, Amelia Park Beef H., Adia H., 2d WATC Sheila Gwynne Classic, L, Westspeed 3YO P., 3d WATC Amelia Park 3YO P., Kirin Megumi H., 4th WATC Sir Ernest Lee-Steere Classic, Gr.3, Birthday S., L.
GANGBUSTER (Blackfriars). 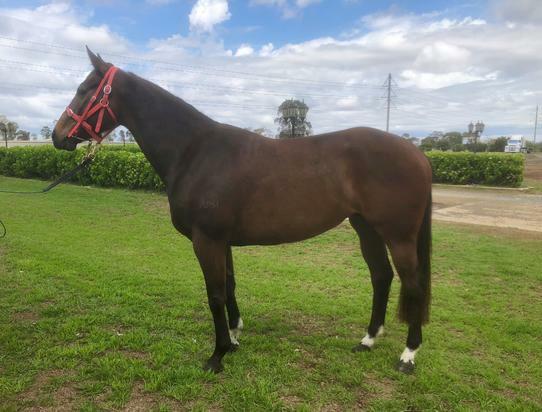 3 wins-1 at 2-at 1300m, 1600m, A$181,570, to 2018-19, WATC Lex Piper S., L, Melbourne Cup Tour Dinner 2YO P., 2d WATC Amelia Park 2YO P., Amelia Park Lodge H., Del Basso Smallgoods H., 3d WATC Challenge S., L, 4th WATC JC Roberts S., L.
Glenmaura (f. by Bel Esprit). 3 wins to 1300m, MRC Design to Print International H., 2d MRC Hyland Race Colours H.
Quick Acting (f. by Pure Theatre). 2 wins at 1200m, 1300m in Aust. Gentlemen's Honour (g. by Honours List). 2 wins at 1200m, 2000m, Singapore TC Class 5 H., Class 4 H., 2d Singapore TC Class 5 H.-4 times, 3d Singapore TC TD Securities Cup H., Initiation P., Class 4 H., Class 5 H.-3 times. Blue Hope (c. by Statue of Liberty). Winner at 2 in 2017-18 in Aust. Impala Bullet. 10 wins-1 at 2-to 1200m, A$198,180, STC Westmead Welter H., AJC Inglis H., STC Rosemount Estate H., 2d AJC Rozelle Welter H.
Miss Doopsy. 8 wins. See above. HOLLOW BULLET (Tayasu Tsuyoshi). 6 wins-1 at 2-from 1000m to 2500m, A$1,464,202, VRC Oaks, Gr.1, STC Arrowfield Stud S., Gr.1, VRC Wakeful S., Gr.2, MRC Tranquil Star S., Gr.3, Boronia S., L, 2d MRC Thousand Guineas, Gr.1, MVRC Woodstock Mile Oaks, Gr.2, VRC Vanity S., Gr.3, MVRC Watsons Catering Equipment H., Metropolitan Hotel 2YO P.H., 3d MVRC William Crockett S., L, Dane Ripper 2YO H., 4th AJC Australian Oaks, Gr.1, STC Coolmore Classic, Gr.1. Producer. LAST BULLET (High Chaparral). 3 wins-1 at 2-at 1200m, 1400m, A$156,820, SAJC Breeders' S., Gr.3, Peter Elberg Funerals H., MAC Drink Driving? Grow Up H., 3d SAJC Dominant H.
MAMA'S CHOICE (Redoute's Choice). Winner at 2, A$120,930, MRC Chairman's S., L, 3d SAJC Laelia S., L, MVRC Mitchelton Wines P., 4th ATC Stan Fox S., Gr.2.